The main idea of "The Invalid’s Story" by Mark Twain is the power of imagination. According to the plot, the narrator had to transport the body of his friend who died a day before. The coffin was mistakenly replaced by a box of guns, which was intended to be shipped to a rifle company in Illinois. 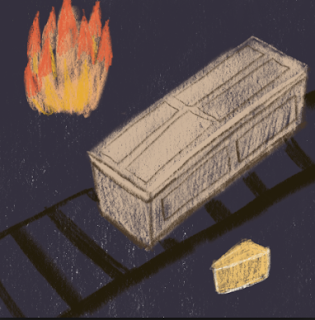 As the train moved off, a stranger put a piece of Limburger cheese on the box. Nor the narrator nor the expressman (his name was Thompson) knew about the replacement of the boxes, they were sure that the corpse was inside. Meanwhile, the expressman made up a tremendous fire in his stove and the Limburger cheese melted. The strong odor spread over the car. It was a smell of the cheese but nobody knew it, all were pretty sure that it was the smell of putrefaction. Thompson tried to suppress the smell by burning other staff such as chicken feathers, dried apples, tobacco leaves, rags and old shoes and so on. The smell became unbearable. The narrator and Thompson tried to catch some fresh air but because of the cold weather (it was winter), it wasn't a good idea. Finally, the narrator got a fever. Unconscious, he spent many days in the hospital, and only after losing his health, being already an invalid, he knew that instead of the corpse there was a box of guns with him. Mark Twain described the strength of self-suggestion in a humorous manner. This feature of human character is universal and it makes the story quite enlightening.